According to the Worldbank, Kuwait’s GDP was $176.5 billion in 2011. In 2011, Kuwait’s economy ranked 51st in the world in nominal GDP. 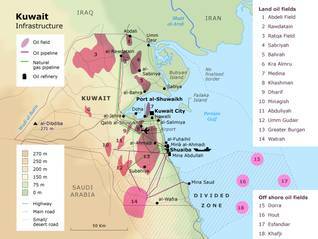 Kuwait remains dependent on petroleum revenues: oil accounts for almost half of its GDP and 95 percent of government income. Because of the almost complete dependence of Kuwait’s economy on petroleum products, it fluctuates strongly with the highs and lows of the volatile global oil market. According to the World Bank data, the Kuwaiti gross domestic product (GDP) had reached in the year 2015 to 114.04 billion US dollars, in comparison with 162.6 billion dollars in the years 2014 and 2013 respectively. The International Monetary Fund points that the GDP per capita in the year 2015 had reached 27756 US dollars. It is predicted that the Kuwaiti GDP will witnesses a growth by a rate of 2.6% during the year 2017, in comparison with 2.5% and 1.1% in the years 2016 and 2017 respectively. The inflation rate in 2017 had reached 3.8%, in comparison with 3.4% and 3.2% in the years 2016 and 2017. The World Bank sees that it is a must to support the Kuwaiti economic activity through increasing oil production, and providing an investment plan between the years 2015 and 2019 and main partnership projects between the public and private sectors, which due to it will lead to support growth in the non-oil sector(s). 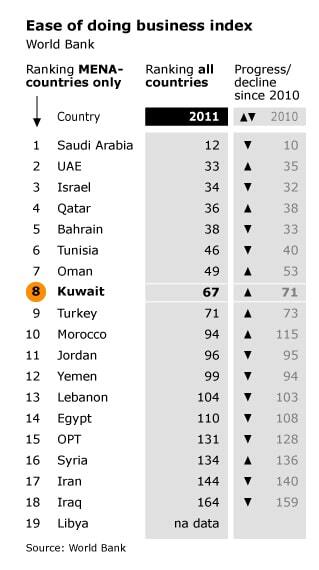 Kuwait had occupied the 38th rank on the Global Competitiveness Report for the period stretching between 2016-2017. The present ruler Sheikh Sabah al-Ahmad al-Sabah and his nephew, former Prime Minister Nasser al-Mohammed al-Ahmed al-Sabeh, have been introducing economic-reform bills since coming to power in 2006, but most initiatives of the executive branch have been thwarted by the legislature, leading to repeated dissolution of Parliament by the Emir. The parliamentarians’ refusal to approve most of the economic-reform bills is, in part, politically motivated. The opposition wants political reform to precede economic liberalization. Most importantly, opposition members demand the right to influence the formation of a new government, which is now handpicked by the Emir. The opposition portrays the present government as corrupt and incompetent, but the opposition’s position is also influenced by its conviction that the government’s reform package will only benefit the current business and political elite, not the population as a whole. The government, for its part, accuses the opposition of populism and irresponsibility, and many suspect that the Emir is seriously considering suspending Parliament once more, this time indefinitely. The economic history of Kuwait can be divided into four eras with distinct economic features. The first is the pre-modern period (until about 1850), when there were no nation states in the Gulf, and the commerce of the British Empire did not yet dominate the region. Because there was no modern bureaucratic state in Kuwait or in any of the other Gulf sheikhdoms, Arab traders in the Gulf moved relatively freely around the region. Together, the great Arab and Persian trading families of the Gulf dominated a regional economy based on pearling, fishing, and transit trade between south-western and South Asia, and to a lesser extent with eastern Africa. In the second era, lasting roughly until the 1950s, the regional economy was dominated by the British Empire. Local merchants could thrive only by participating in the British imperial – more specifically, the British-Indian – economic and political sphere. Some local traders therefore acted as official or unofficial representatives of the British(-Indian) Crown in the Gulf sheikhdoms, as did the Persian merchant Hajji Alireza in Kuwait town, from 1899 until 1904. The third era, which may now be nearing its end, is characterized by the steadily shrinking influence of Great Britain and the rise of American influence; the rise and subsequent hegemony of highly centralized, bureaucratic nation-states; the rise of monolithic, statist economies based on petroleum revenues; and growing economic ties with post-colonial states in South and East Asia. Kuwait has been a regional forerunner in most of these respects. In 1961 it was the first of the Arab sheikhdoms to gain independence. Kuwait and Bahrain were the first of the present Gulf Cooperation Council (GCC) states to construct a modern, centralized welfare state, with state-of-the-art infrastructure, education, and health-care systems, all financed with oil revenues. It was also the first in the region to base its economy almost exclusively on oil, or oil-related income, a development that is seen increasingly as a curse rather than a blessing: the law of the handicap of a head start – which holds that forerunners often have the most trouble adapting to new circumstances – certainly applies to Kuwait. Entering the fourth economic era, characterized by economic liberalization and diversification, Kuwait is lagging behind its neighbours. As this fourth era has not yet been fully entered by any of the Arab Gulf states, it is better to speak of an intended rather than an actual policy. Most Gulf States have, however, made significant strides in the last decade in at least attempting to open their economies to private investors and entrepreneurs. A report by the World Bank, Doing Business in the Arab World, published in November 2009, emphasizes this trend, but the report also makes clear that Kuwait’s economy is one of the most statist, and therefore most static and impenetrable, in the region. In the World Bank ranking of the most business-friendly countries in the world, Kuwait is listed 67th, behind Dominica and Azerbaijan; all GCC countries, except for Oman, rank higher, with Saudi Arabia (12th) and the UAE (33th) leading the group. In the ease of starting a business, Kuwait ranks a dismal 137th. On average, it takes 35 days to finish all the procedures needed to establish a business in Kuwait (compared with 19 days in none too business-friendly Mauritania and only five days in Saudi Arabia). The former trading centre Kuwait, with its rich merchant tradition, now ranks 109th in the world in ease of cross-border trade. The total length of Kuwait’s road network has been estimated at almost 6,000 kilometres in 2006. That year, 975,000 private automobiles were registered, an increase of almost 30 percent in just four years. The 3,000 buses of the state-owned Kuwait Public Transport Company (KPTC) provide domestic services as well as regular services to Mecca, in Saudi Arabia. In addition, 18,000 private buses, 184,000 trucks, and 9,200 taxis facilitate the mobility of the nation’s inhabitants. In 2007, almost 7 million passengers used Kuwait International Airport, up from 4.3 million in 2003. The national airport is currently being expanded and modernized. It is designed to accommodate 20 million passengers per year in the near future and 50 million passengers at a later stage. Kuwait’s largest commercial seaport is Port al-Shuwaikh, west of Kuwait City. The second largest commercial port is located near the Shuaiba Industrial Area, 56 kilometres south of Kuwait City. Here, the Gulf is much deeper, allowing larger vessels to moor. It is for just this reason that the oil terminals of Mina al-Ahmadi and Mina Abdullah are also located along this short stretch of coast. The Kuwait Ports Authority is directed by a member of the ruling Al Sabah, a sure indication of the prime importance of these ports in the country’s economy. Nevertheless, plans for their privatization are being discussed. For an in-depth overview of Kuwait’s energy sector click on the button below. The finance, real estate, and business services sector is the second contributor to the nations’ GDP, after oil (17 percent in 2007). The global financial crisis hit Kuwait late but hard. Local money supply and credit conditions deteriorated rapidly in the final months of 2008, and the money market remained tight through 2009. 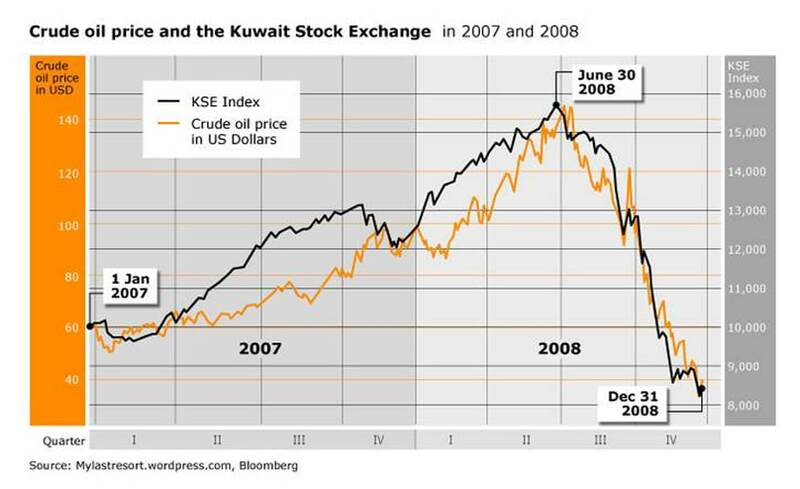 The Kuwait Stock Exchange (KSE) plummeted 45 percent in autumn 2008. Local investment companies recorded a combined loss of more than USD 32 billion, and two of them collapsed. The Kuwaiti government reacted with an emergency financial-stability law, which provided a safety net for struggling banks, in return for stricter risk-management regulation. All local bank deposits were guaranteed by the state, and a USD 5.4 billion emergency investment fund was established to shore up the ailing stock market. Some local investment firms have been partly bailed out by the government. The KSE rebounded partially in the second quarter of 2008, with a 182 percent increase in traded shares. The local real-estate market, which was especially hard-hit by the sudden financial contraction, also appeared to recover. Consumer debt stood at an estimated USD 25 billion in late 2009. Kuwaiti citizens expect the government to bail them out of financial difficulties, as it has often done in the past. The state appears to be able to afford this in the short term. Due to lower spending and recovering oil prices, the state continued to run a billion-dollar budget surplus in 2012, but the nation’s long-term investment portfolios have suffered. This is partly because the state drew from these funds to finance its economic stimulus and safety packages, such as the stock-market investment fund, and partly because of losses in overseas investments, particularly in American banks. The Kuwait Investment Authority, which manages the emirate’s sovereign-wealth funds, is said to have lost USD 31 billion in the second half of 2008. This amounts to roughly 15 percent of its estimated total investments portfolio. The state has also dug deep into its foreign-exchange reserves, which were estimated at USD 17 billion in 2008. Almost continually rising oil prices from 2004 until 2012 (with a dip in 2008) led to consecutive record surpluses in Kuwait’s foreign trade balance. Kuwait’s export earnings totalled USD 89 billion in 2008, of which USD 85.5 billion (96 percent) came from hydrocarbon products. The effects of this huge influx of oil money have not been entirely beneficial to the country. Local wholesale and consumer prices have skyrocketed, with inflation peaking at 11.6 percent in August 2008. 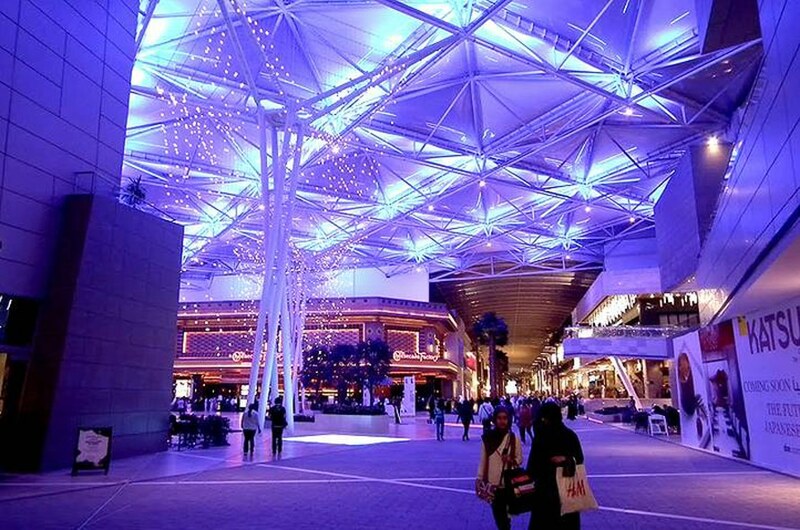 Japan was Kuwait’s main export destination in 2007, providing 14 percent of total export revenues. South Korea, Singapore, and the United States had shares of 12.2, 7.3, and 6.2 percent, respectively. After hydrocarbons, hydrocarbon-related products, such as chemicals and plastics, were the second source of foreign revenue (2.5 percent). 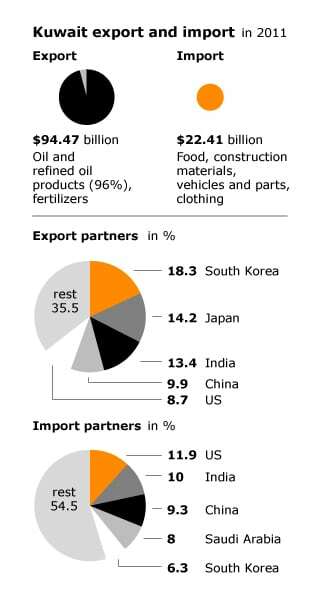 These commodities are sold primarily to Saudi Arabia, the UAE, Indonesia, and Pakistan. Import expenditures reached USD 25 billion in 2008, up from USD 20.6 billion in 2007 and USD 14.3 billion in 2006. The most important imports are transport equipment, machinery, and unprocessed metals, which collectively typically make up about 60 percent of total import value. Food and live animals accounted for roughly 10 percent of import value in the period until 2006, followed by chemicals at roughly 8 percent. In 2007, the US was Kuwait’s main source of imports (14.1 percent), followed by Japan (9.2 percent), Germany (8.1 percent), and China, Kuwait’s fastest growing trade partner (7.7 percent). In the coming years, Iran is expected to become a main import partner of Kuwait, as a source for LNG and fresh water, both of which are strategically very important. This will certainly trouble both the United States and the political leadership of Saudi Arabia. The latter is presently Kuwait’s main trading partner in the Gulf (6.3 percent of total import expenses in 2007). 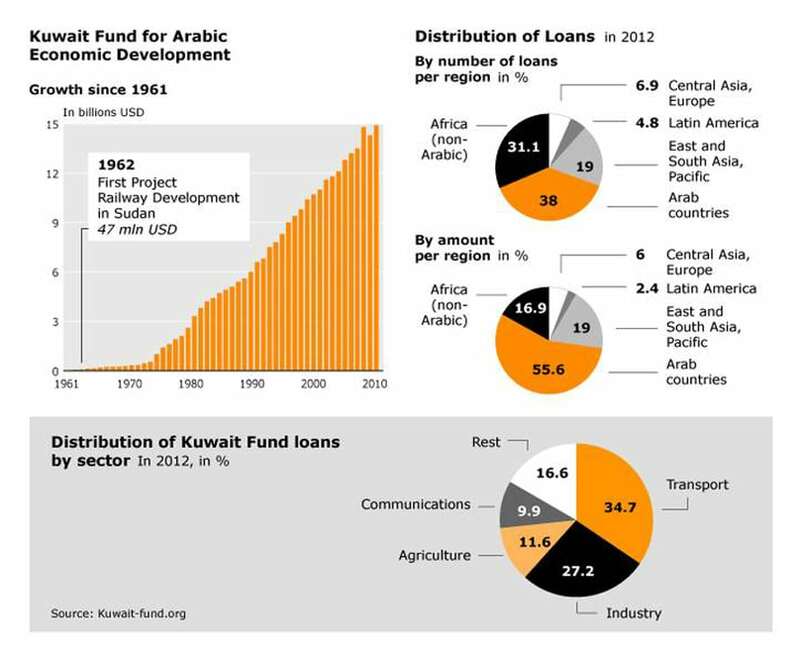 In 2007, agriculture and fishing contributed just 0.2 percent to Kuwait’s GDP. Most of the country’s food, even most of its fish, has to be imported (at a cost of about USD 1.8 billion in 2005). The country has a total area of irrigated agricultural land of 7,000 hectares (0.4 percent of the total land area). The primary crops are tomatoes, potatoes, cucumbers, gherkins, and aubergines. Kuwait’s principal livestock is not camels (just 5,000) but chickens (more than 32 million). Sheep (about 900,000) form the second type of livestock. Annually, this results in some 46,000 metric tons of locally produced chicken meat, 22,000 tons of eggs, and 30,000 tons of mutton and lamb. Kuwait’s 28,000 cows produce 40,000 metric tonnes of milk per year. The agriculture and fishing sectors employed 34,800 workers in 2006 (1.7 percent of the total labour force). Only 200 of them were citizens. In 2007, in addition to importing more than USD 200 million worth of chicken meat and more than USD 100 million worth of prepared foodstuffs, Kuwait had to import large quantities of food staples, such as rice (USD 168 million) and barley and wheat (each costing more than USD 48 million). The country’s continually increasing dependence on food imports has led the government to acquire large tracts of farmland in Cambodia and Sudan. Given Kuwait’s own long historical struggle to nationalize its natural resources, the fact that it is now engaging in the controversial practice of buying or leasing farmland in underdeveloped countries (the so-called ‘farms race’) is striking. Like all smaller Gulf Cooperation Council states, Kuwait considers the development of a local tourist industry an important part of its economic diversification package. Most investment money has gone into increasing hotel capacity. The number of guests visiting Kuwait has increased spectacularly, from 90,000 (280,000 nights) in 2004 to 292,000 (408,000 nights) in 2007. In 2004, most foreign visitors came from Saudi Arabia (896,000, or 30 percent). Since their number greatly outweighed the number of hotel guests, these were almost exclusively day-trippers. They certainly did not come to admire the country’s museums; the number of museum visitors in Kuwait decreased from 64,000 in 2004 to 33,000 in 2006. The hotel and restaurant sector contributed only 0.6 percent to GDP in 2007. Because of Kuwait’s ban on alcohol consumption, the country is less competitive than the UAE in the market for European tourists. According to the CIA World Factbook, Kuwait’s labour force totalled 2.24 million in 2011. The Public Authority for Civil Information (PACI) estimated that Kuwait’s labour force totalled 2.09 million in December 2007 (61 percent of the total population). 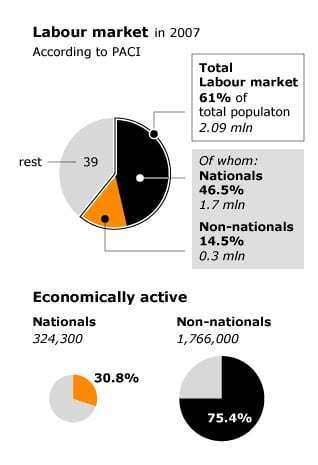 Only 15 percent of the labour force consisted of nationals (324,300), down from 17.4 percent (341,200) in 2006. 75.4 percent of the foreign population were registered as economically active, compared with just 30.8 percent of the national population. The latter low figure is not the result of the absence of local women in the labour market – the share of females in the local labour force grew from 41.7 percent in December 2006 to 43.7 percent at the end of 2007. The foreign labour force is overwhelmingly male (about 80 percent). The large majority of nationals work in public administration (78.8 percent). At the end of 2007 just 2 percent were employed in the private sector, which was still a marked increase of 15.7 percent over December 2006. As of December 2008, 16,641 citizens (4.9 percent of the national workforce) were registered as unemployed. In principle, both citizen and non-citizen workers can establish and join labour unions in Kuwait, although the latter can do so only after five years of residence and only as non-voting members. There are many restrictions: strikes are allowed only after government approval and compulsory external arbitration of the dispute; union financing depends on state subsidies, and no more than one union may be established in any occupational trade. Only 3 percent of the Kuwaiti workforce is unionized. Kuwait pioneered foreign aid in the Arab world with its establishment of the Kuwait Fund for Arab Economic Development (KFAED) in 1962. This initiative was motivated partly by Iraqi threats to invade the newly independent country. Kuwait’s foreign aid reached its highest level during the second half of the 1970s, then ranging between 8 percent and 15 percent of its gross national income. Since 1981 the fund has been self-financing; repayments are used to provide new loans and grants to developing countries in both Asia and Africa. Up to 2003, it had made loans to 99 countries, for a total of KD 3345 billion (about USD 11 billion at current exchange rates) and supplied KD 335 million (USD 1.2 billion) in grants and technical assistance to 163 countries.